The everyday realities of educational practices of the Third Reich are reconstructed in the memoires of involved observers of these processes. The most of them can be used as a factual supplement to theoretical reflections on totalitarian transformations in education as their subjective perceiving. Despite of different origin and life attitudes all the authors of translated fragments are concentrated on those features of totalitarian educational innovations which show their completely incompatibility with the humanistic tradition in education. The everyday life of universities’ and school’s communities in the Third Reich was determined by the national-socialist ideology. The recalling on Heidegger’s activities as the rector of the University in Freiburg (H. Gottschalk, H. Jonas, K. Löwith, G. Cesar) expose the ambiguity of his way of thinking and acting, what was also noticeable in his habitus. His nationalism was not combined strong with the anti-Semitism in the university’s management. The race theory as a part of national-socialism ideology wasn’t definitive for the everyday life in those educational institutions, where the educational traditions were connected with the humanistic values existing in families (L. Schmidt, G. Cesar). Some attempts to stimulation of the pro-social behavior of pupil and students (helping and solidarity) were not effective in the Third Reich because of their directive nature (G. Cesar). The comparison of the national-socialism model of the school and the Lichtwark School taking by L. Schmidt demonstrates the advantages of non-indoctrinated educational institutions with the pedagogical and social freedom used for the all-side development of pupil personality. The experience of the membership in BMD (League of German girls), connected with the force working is critically analyzed by G. Cesar and L. Schmidt. The social status of women and their educational influence in the family of the Third Reich design is reconstructed by B. Vinken. She shows that the fascist ideology provides only the subordinated role of women in all spheres of the social life including the educational practices. 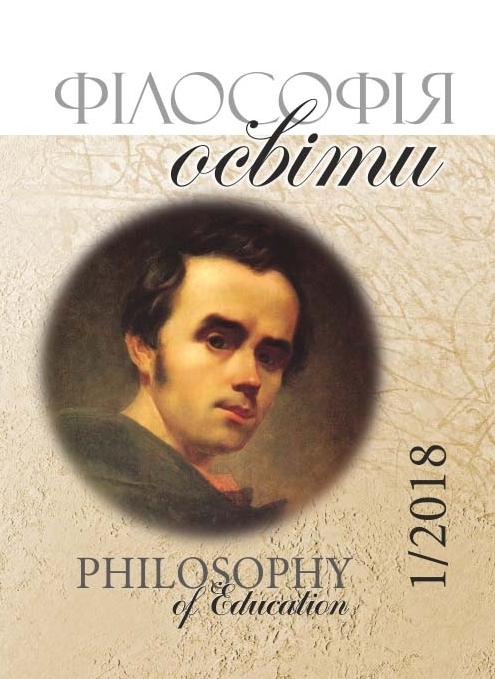 Doctor of philosophical sciences, Professor, Corresponding Member of the National Academy of Educational Sciences of Ukraine, Chief of philosophy department, H.Skovoroda Kharkiv National Pedagogical University, President of the Ukrainian Philosophy of Education Society, Translator of contemporary foreign philosophers’ books into Ukrainian (U.Beck, W.Welsch, H.Gadamer, J.Habermas, H.Jonas, R.Rorty etc.). Cesar, G. (1994). Wanderungen durch die bewegten Zeiten. Sassenberg: Pavo-Verlag. Schmidt, L. (2012). Gezwungen, früh erwachsen zu sein. In: Schmidt Helmut, Schmidt Loki. Kindheit und Jugend im Dritten Reich. Berlin: Pantheon, 23-81. Vinken, B. (2011). Der Mutterkult im Nationalsozialismus. In: Lust am Denken. Hrsg. K. Rotter und K. Wulffius. München: Piper, 97-102.